Saints Herodion (Rodion), Agabus (Ahab), Asinkritos, Rufus, Phlegontos and Hermas are among the Seventy Disciples, chosen by Christ and sent by Him to preach (Sobor-Assemblage of Seventy Disciples – Comm. 4 January). The holy Disciple Herodion was a kinsman of the Apostle Paul and his companion on many journeys. When Christianity had spread to the Balkan Peninsula, the Apostles Peter and Paul established the Disciple Herodion as Bishop of Patara. The Disciple Herodion zealously preached the Word of God and converted many of the Greek pagans and Jews to Christianity. After this, Saint Herodion continued to accompany the Apostle Paul some years further. 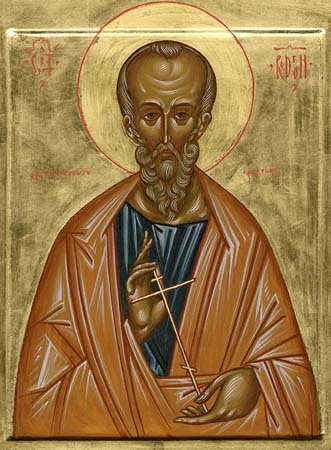 When the holy Apostle Peter was crucified (+ c. 67), the Disciple Herodion at the same time also and with Saint Olympos was beheaded by the sword. The holy Disciple Agabus was endowed with the gift of prophecy. He predicted (Acts 11: 27-28) the famine during the time of the emperor Claudius (41-52), and foretold the suffering of the Apostle Paul at Jerusalem (Acts 21: 11). The Disciple Agabus preached in many lands and converted many pagans to Christ. The Disciple Rufus (Ruphus), to whom the holy Apostle Paul gives greeting in the Epistle to the Romans (Rom. 16: 11-15), was bishop of the Greek city of Thebes. The Disciple Asincritos (Rom. 16: 14) – was bishop in Hyrcania (Asia Minor). The Disciple Phlegontos – bishop in the city of Marathon (Thrace). The Disciple Hermas – bishop in Dalmatia (there is yet another Disciple from the Seventy by the name of Hermas, who occupied a cathedra-seat in the Thracian city of Philippopolis). All these disciples for their intrepid service to Christ underwent fierce sufferings and were found worthy of a martyr's crown.